Lights on the other side of the lake and headlights from an aproaching car. Our car is still on "dryland"
Few days ago we went to pick up the two sleds, we had delivered to Roros by our Czech fellow mushers Jindra Zelenka and Jana Hola, and equipment. Thank to mushers Nisse and Annica Uppström, the sleds made it to Sweden and our friend Malin brought the equipment. Now it was time to take the borrowed car (huge thank you Britt-Marie and Maria!) and fetch the stuff. Once again - thanks to all that helped us organize and bring the stuff for us from Roros, when our car broke down and we got stuck with the dogs on the way! What an adventure the trip was, when we found out there is a possibility of making a short-cut over the huge lake Storsjön in Östersund. 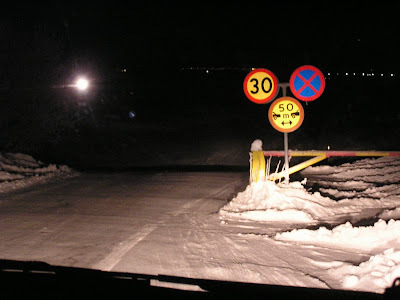 First we thought it is too risky to take the advice of driving over the ice, but how silly were we (shows how we can still get surprised by the common Nordic solutions! ), when we found an offical sign by the Road Department, official information, road marking and perfectly cleaned and maintained ice road, with two lanes, wide and safe as any other road! 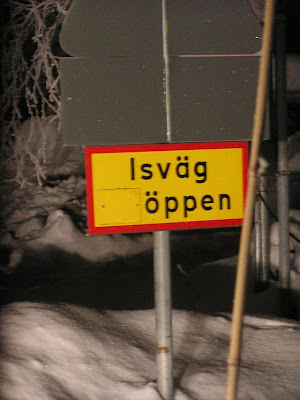 The offical sign: "Ice Road - open"
The signs showed, among other information, what distance cars should keep between each other, speed limit, maximum weight of automobiles (12 tons!) , etc. Information about daily measuring of ice thickness was also available on information boards at the outlets to the ice, from the "normal" roads. As usual - practical and perfect solution!